As mentioned in my previous Maggi post, here’s the last batch of noodles I needed to go through. 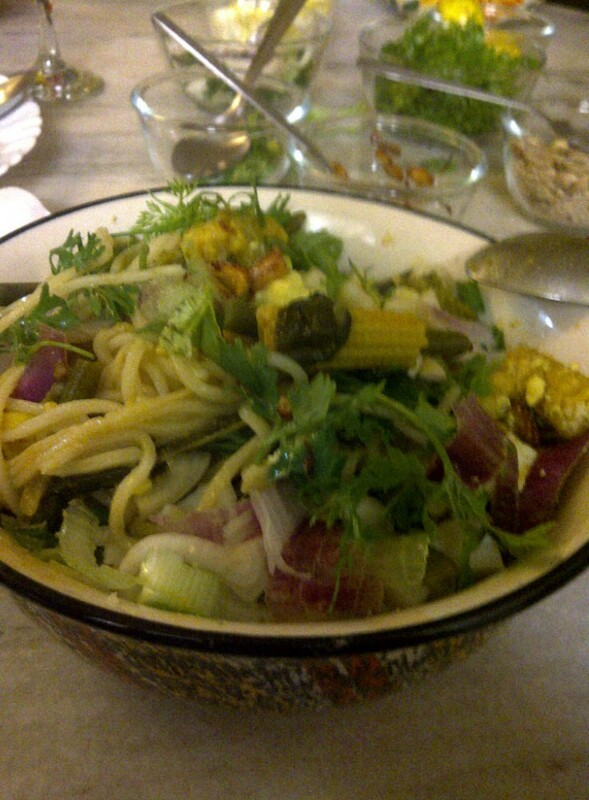 I have tried to Oriental-ise the ever-so-popular noodles by including baby corn, broccoli and tofu. Add a few drops of soy sauce when eating and you will find yourself with the yummiest, most comforting bowl of steaming noodles with vegetables which will taste nothing like the Maggi you are used to. Without much ado, let’s get cooking. Oh, and now, I am on that Maggi moratorium! Wash and slice the green chill across its length and then slice each half. So, you end up with 4 long slices from each chilli. Wash, de-core, de-seed and slice the red pepper. Wash and slice each baby corn into 4 along its length (like the chilli). 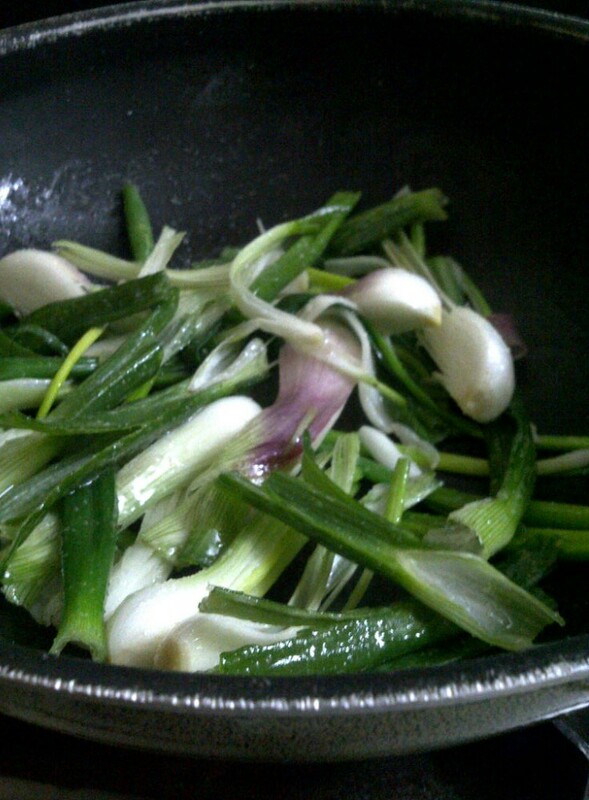 Separate the green part from the white bulb of each spring onion. In this recipe, we are only using the white bulb so you can keep the green part for some other use. Take each spring onion bulb and slice it in 4 like the baby corn and chilli. Wash, dry and tear the basil leaves. Heat the oil in a wok like pan. Once the oil is hot, lower the heat and add the chopped onion and sliced chilli. Add the sliced red pepper and cook for 3 more minutes. Next, add the baby corn and broccoli. Stir well, cover and cook for about 5 to 7 minutes. Uncover and add the water and tastemaker spice mix. Once the water starts boiling, add the noodles and push them down gently into the water and vegetable mix. You may prefer to do this with a fork so as not to break the noodles. Once the noodles are thoroughly mixed with the rest of the ingredients, cover and cook for 3 to 4 minutes. Uncover, add the basil and tofu and, once again, mix gently. Take off the heat and let the noodles sit for a few minutes before serving. Only a kooky cook like me can convert a 2 minute Maggi into a 45 minute elaborate recipe, right?! 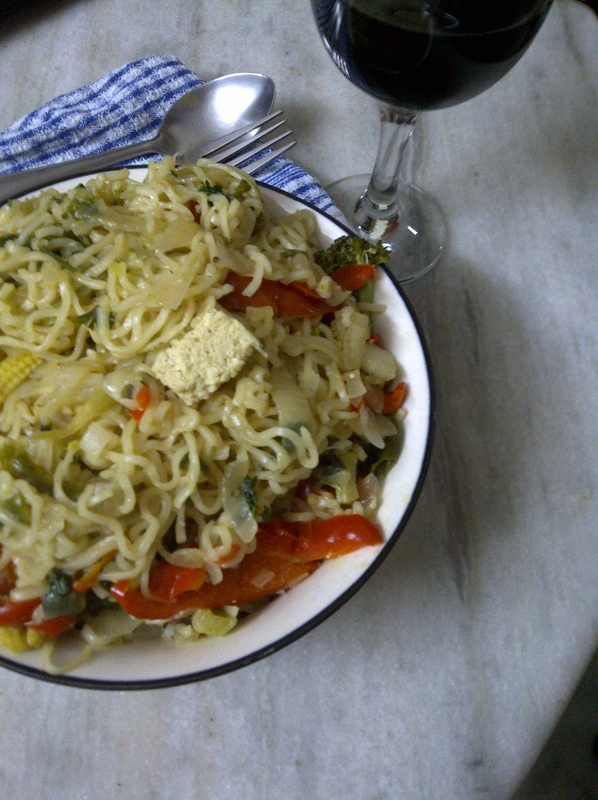 But this is – by far – the BEST Maggi I have cooked. In case you are interested in trying out the recipe in your kitchen, worry not. 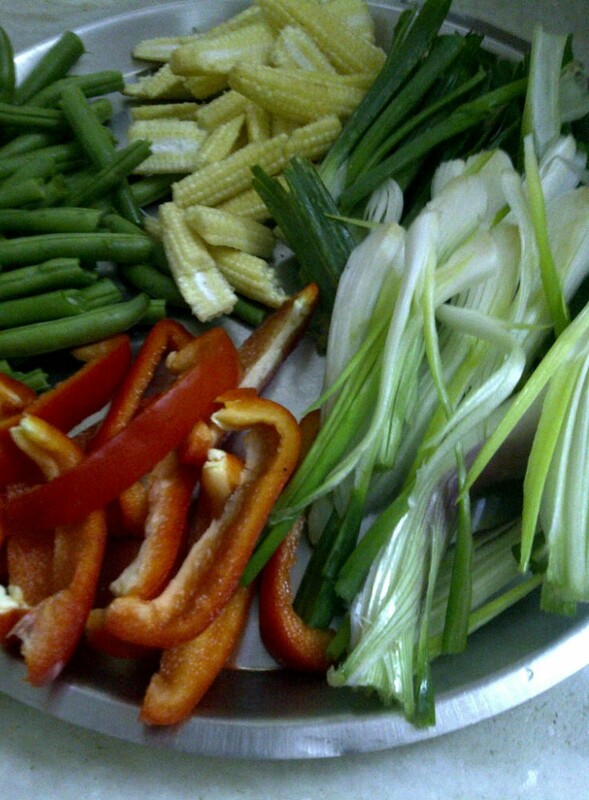 Most of the time goes in preparing the vegetables. The actual cooking time is about 10-12 minutes. Unlike my previous versions, this is a one-step method which does away with oil and stir-fry business. It was suggested to me by my flatmate friend who introduced me to Maggi in the first place. I was a bit unsure as to how it would turn out since I don’t like the thought of boiled onions (!) but she convinced me to give it a go. And no regrets. 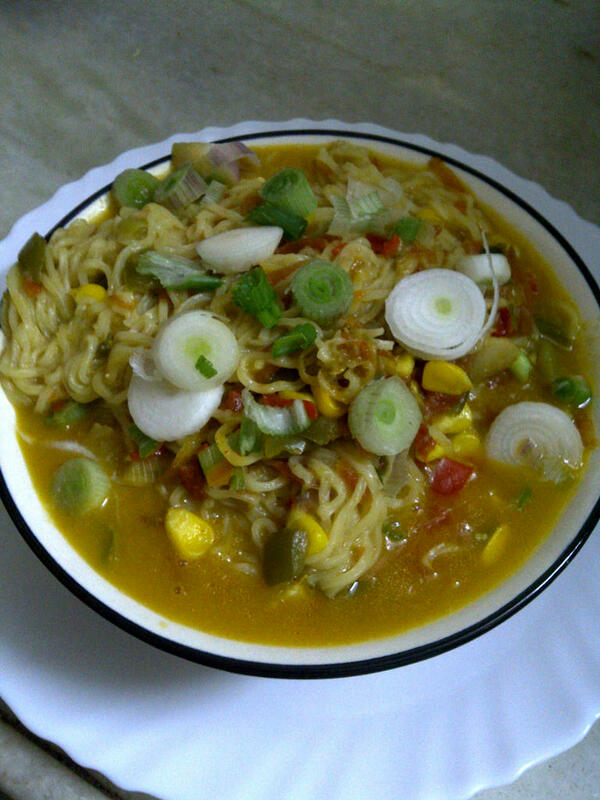 I still have one more round of Maggi to get through after which we will observe Maggi moratorium ;-). Dry roast the seeds till they turn a couple of shades darker and release nutty aroma. Set aside. Break the french beans into 2 to 3, depending on their size. Wash and set aside. Wash, de-core, de-seed and dice the pepper. 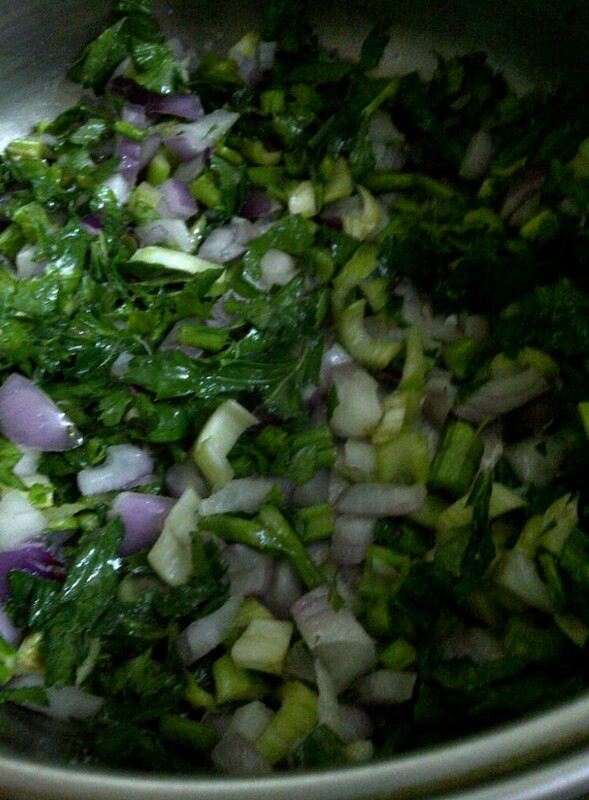 Put all the vegetables in a cooking pot along with 1.5 cups of water. If you are adding salt for the vegetables, do so at this stage. Bring to boil, lower the heat, cover and cook the vegetables for about 8 to 10 minutes till french beans are tender. Next, add the Maggi noodles, roasted seeds, grated carrots, chilli sauce, cheese (if using) and moong beans. Stir gently with a fork, cover and cook for 2 to 3 minutes till the noodles are soft. I don’t usually stock Maggi noodles but have “accidentally” landed up with a large pack so decided to have them for dinner last night. The addition of onion, cherry tomato, green pepper, carrot and mushroom makes this a guilt free bowl of Maggi and comprehensively provides you with your share of 5-a-day (or is it 7-a-day now?!). I don’t eat enough mushrooms so decided to experiment with them in this recipe. They make a good fit. Also added some nutrient rich, fresh, basil which provides a pleasant twist. Are you a Maggi fan? If so, how do you make yours? Wash and finely chop the green pepper (I kept the core and the seeds). Wash and split the cherry tomato in half. Wipe/wash the mushrooms and, depending on their size, quarter or halve them. Once it is hot, lower the heat and add the chopped onion, chilli and green pepper. Next, add the cherry tomato and again cover and cook for 3-4 minutes. Lastly, add the mushrooms and basil. Cover and cook for 5 minutes. Uncover and add about 2 cups of water. Increase the heat and once the water comes to a rolling boil, add the tastemaker, chilli sauce and cheese. Finally, add the noodle cakes and carrots. Make sure that the cakes are not sitting on top of each other. Gently loosen them with a fork and mix well. Not sure whether Maggi is as polarising as Marmite. 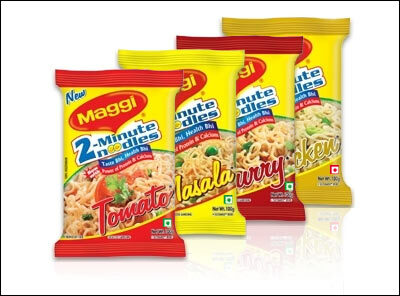 I have a friend who leads a totally unhealthy lifestyle, can eat a proverbial horse and thrives on junk food, yet he will not touch Maggi with a barge pole. Give him the choice between a bowl of Maggi and starvation and he would rather starve! In that context, a supposedly healthy food blog shouldn’t feature Maggi noodles I guess. So I don’t know whether “healthy Maggi noodles” is an oxymoron but this noodle recipe has to be one of my best guilty pleasures, naughty but nice. The past few days have been very busy for me with something or other keeping me away from home. These noodles were cooked on the day I had travelled some 250 kilometers to attend a wedding. By the time I got home, was thoroughly exhausted. As my mum rightly pointed out over Skype, the sensible thing would have been to order in a pizza for dinner. I guess subconsciously, in spite of losing so much weight, I keep thinking that I am fat and so pizza doesn’t figure in my thought process although it is one of my most favourite foods. I mean if someone asks me what I would like as my last meal, it would have to be a loaded pizza. But that’s another story (!) so let’s get back to these super easy, super quick and super yummy noodles. A cake of Maggi is 70 grams so if you are feeding more people or feeling very hungry, adjust the quantity accordingly. The following is for one mealtime bowl. Wash and slice the chillies. Wash, de-core, de-seed and chop the capsicum. Wash and slice the spring onion. Divide it in two portions. Add the chopped onion, one portion of spring onion, tomato, capsicum and chilli. Add a pinch of salt, mix well, cover and cook on low heat for 10 minutes. Uncover, add water (quantity according to instructions on the packet), noodles, sweetcorn, grated carrots and taste-maker. Mix everything together, bring to boil, lower heat, cover and cook for 3 to 4 minutes. Garnish with the remaining portion of chopped spring onion. As temperatures continue to dip, a comforting bowl of hot soup is enough to warm the cockles of your heart. 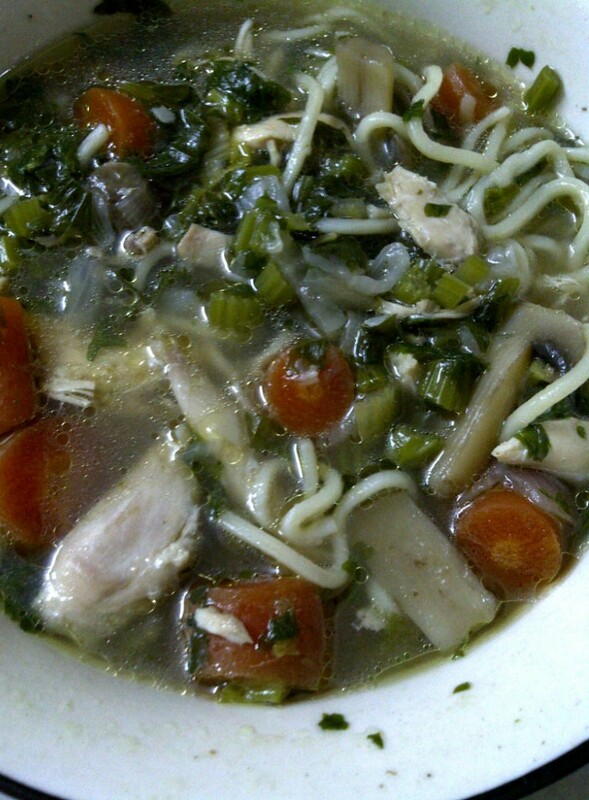 I am sure everybody has their own version of the classic chicken noodle soup. Many require you to cook dry noodles in the chicken stock. My version is a tad different. 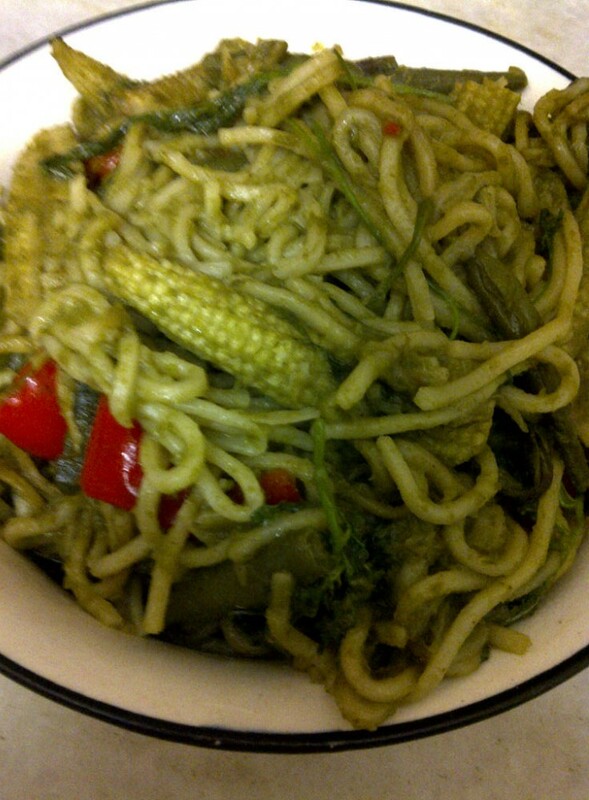 While making Green Noodles, I had cooked extra noodles specially to create this recipe. While serving, I placed the cooked noodles in a soup bowl over which I ladled the hot broth of chicken and vegetables. 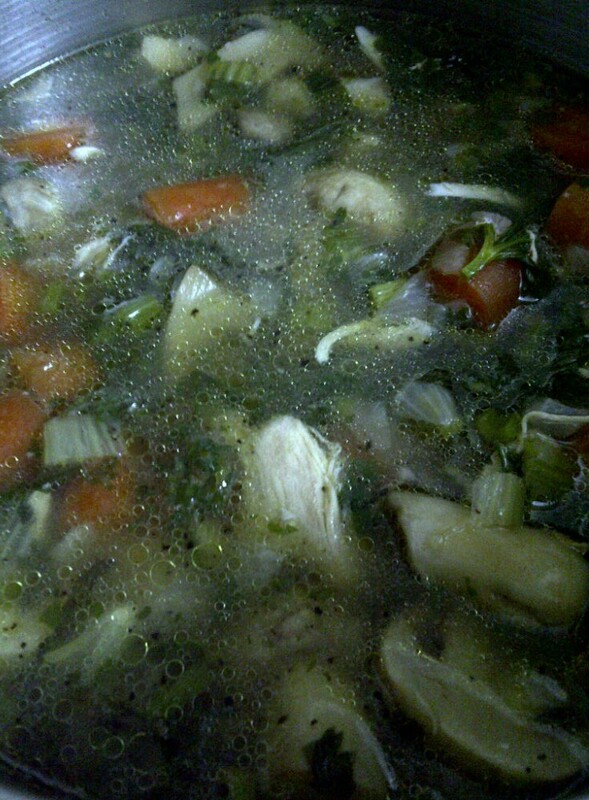 The end result is a reassuring and satisfying soup full of flavour and fragrance. Of course, there is no right or wrong way of doing this. You can cook dry noodles in the broth along with the vegetables if you prefer. In fact, this will probably give them extra flavour. 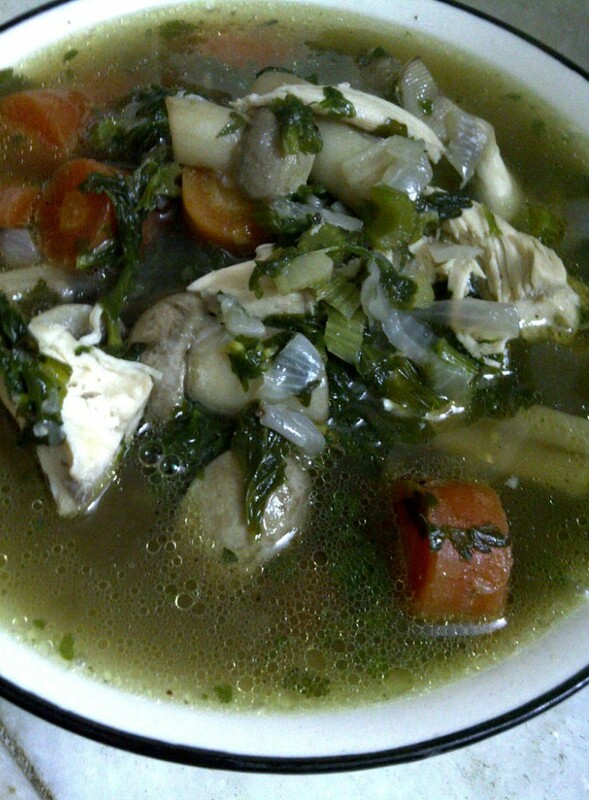 So let’s warm up with today’s flavourful broth of chicken and vegetables over some cooked noodles. First, we need to cook the chicken and make the stock. Peel and wash 2 stalks of celery. 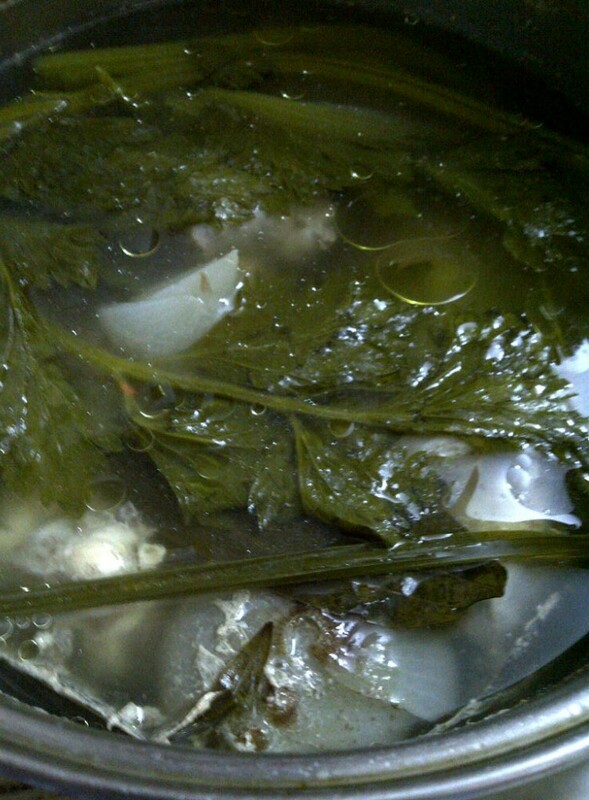 In a pan, place the chicken and the water along with the onion, celery, lemongrass, bay leaves and salt. Bring to a boil, lower the heat and let it simmer for one hour. Place a strainer over a large pot. At the end of the hour, pour the contents of the pan into the strainer. The large pot under it will collect the chicken stock. When cool to handle, discard the vegetables and bay leaves. Take the chicken pieces and separate the flesh from the bones. Now, peel, wash and chop the second onion. Wash (or wipe) and halve the mushrooms. 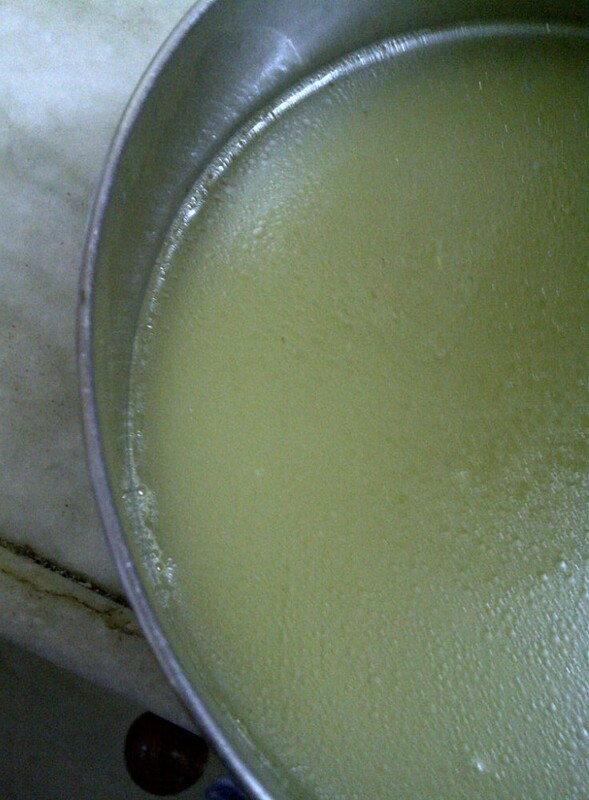 Heat oil in a soup pot (or equivalent). Add the chopped onion and celery. Add some salt to taste. Add the chicken stock. At this stage, check the quantity of the liquid. It should be enough. If not, you can add some water. 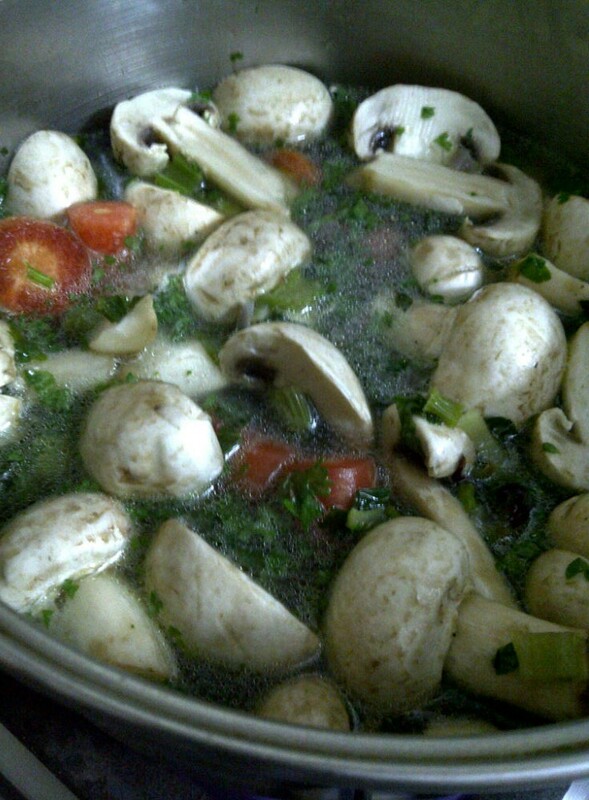 Bring to boil and add the carrots and mushroom along with chopped parsley and pounded black pepper. Lower the heat and cook for 8 minutes. After this time, add the cooked chicken pieces, cover and cook for 2 more minutes. Place noodles in a bowl and pour the hot broth over them. If you don’t have boiled noodles ready, you can add dry noodles along with the chicken and cook according to the time on the packet. Lemongrass is optional. We have some growing in our kitchen window so I decided to throw it in for the stock. 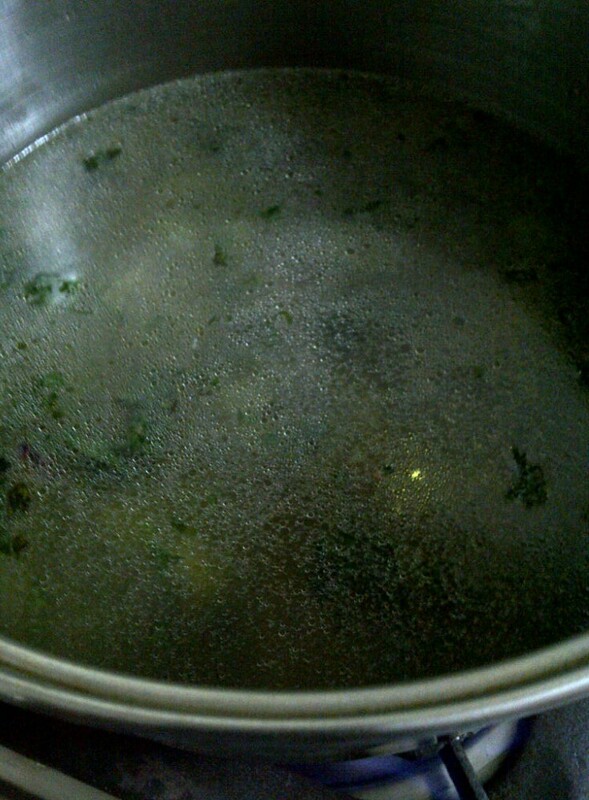 This is what my chicken stock looked like once it was cooked and strained. 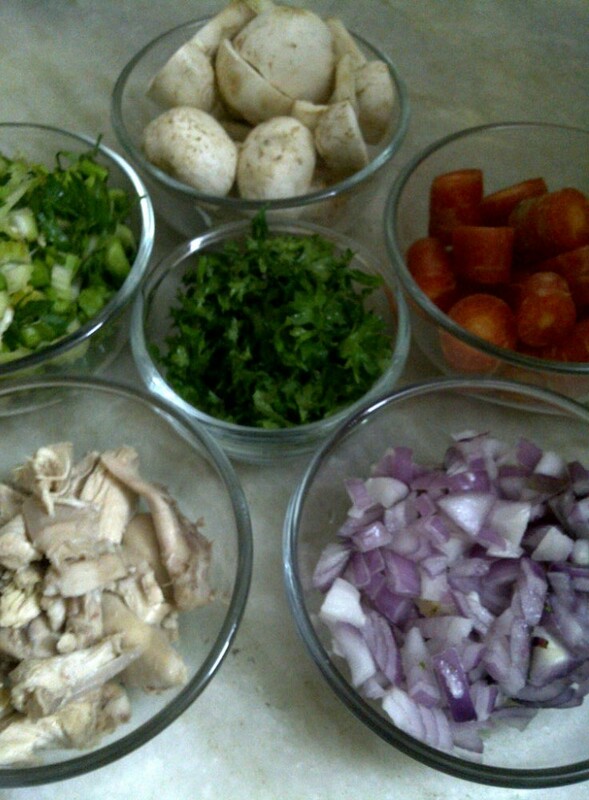 Pictorial of the simple steps involved in cooking this broth. 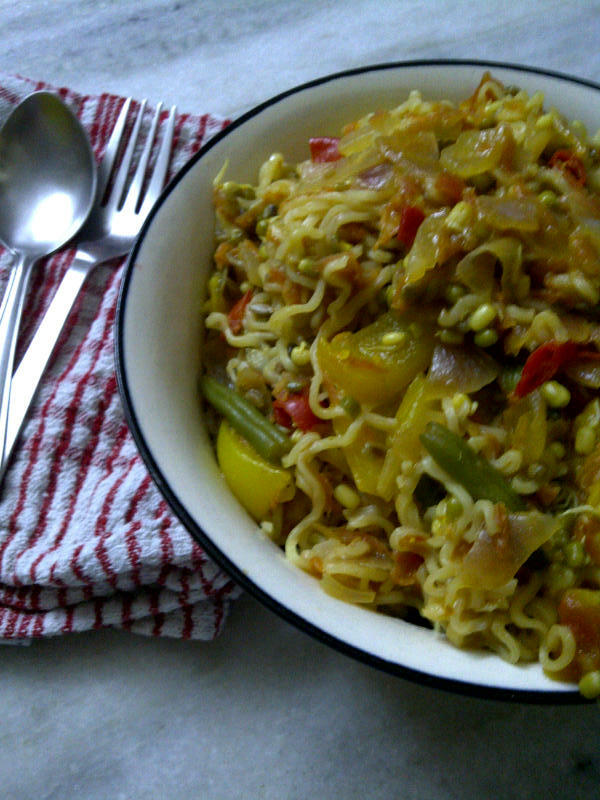 Noodles are very popular throughout the Indian subcontinent. 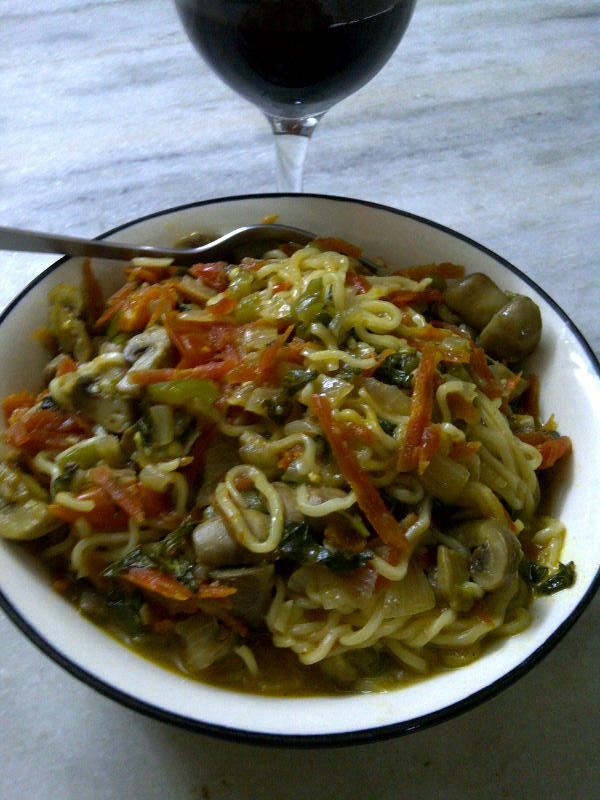 The blog Mental Masala has an insightful post on noodles in Indian cuisine. The beauty of noodles is that they are easily adaptable to local flavours. 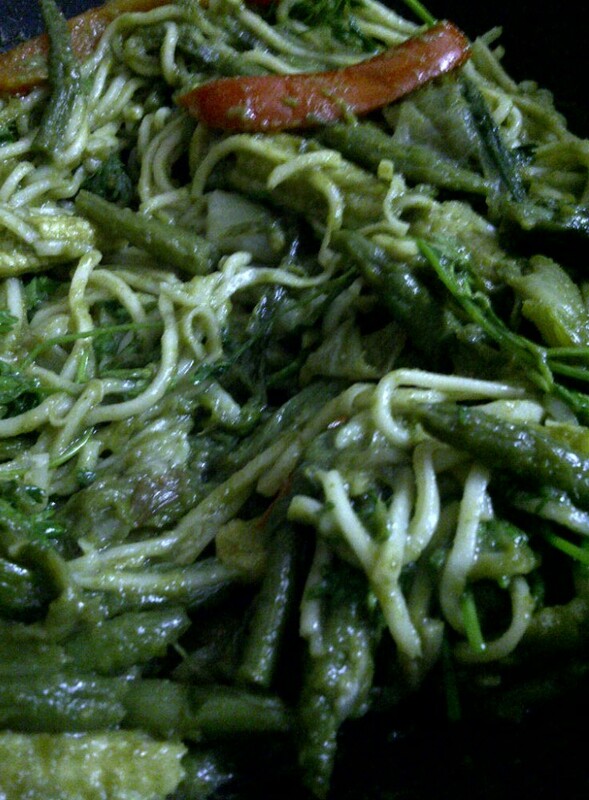 My recipe for Green Noodles is born out of the pairing of two food cultures – Chinese style noodles and vegetables with Indian pesto. If you have some of the pesto lying around in your refrigerator, this dish can be made in a jiffy. Boil noodles according to instruction on the packet. Drain, mix in a wee bit of oil to prevent them from sticking and keep aside. 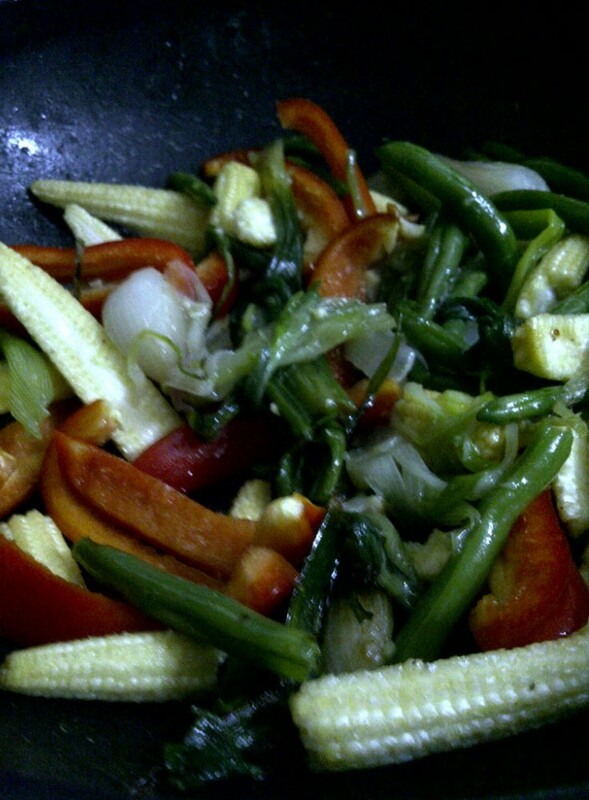 While the noodles are cooking, prepare the vegetables. Wash and slice spring onion. Wash and slice red pepper. Wash, trim and snap into two french beans. Heat a wok and add the sesame oil. Once it is smoking, add the spring onion and salt. Stir it on high heat for a couple of minutes. Add the french beans, again mix well, cover, lower the heat and let the beans cook for 5 minutes. 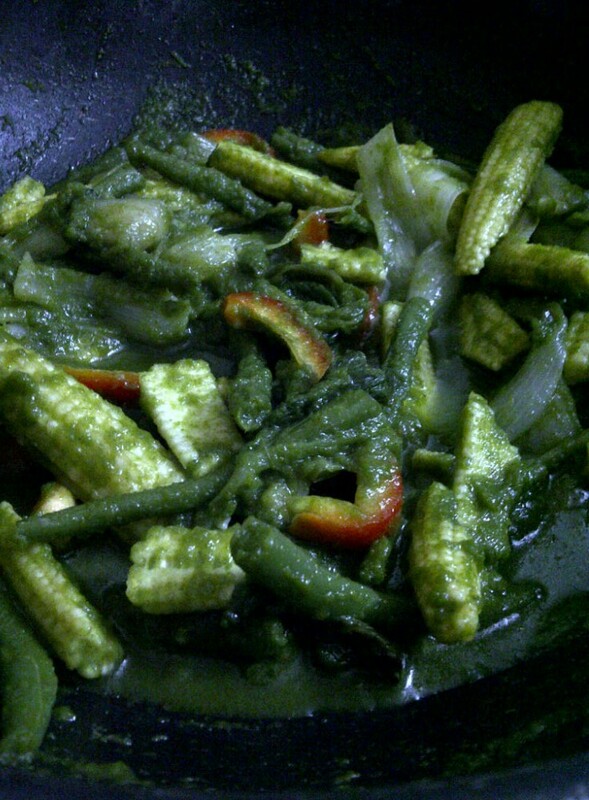 Uncover, add the babycorn, red pepper and Indian pesto. Add 2 to 3 tablespoons of water. Combine well, cover and let this cook for about 10 minutes. Next, add the noodles and coriander. Mix everything together, cover and cook on low heat for 5 minutes till the noodles are heated through. The quantity of noodles is upto you. Either go according to instructions on the packet or what you normally use. Do keep in mind that there are plenty of vegetables in this recipe so you don’t need too many noodles. You can substitute other vegetables but use once which are robust and can withstand the pesto’s strong flavour. Vegetables like asparagus won’t work here. You can add some chopped and toasted cashew or walnut if you like. Here’s step-by-step pictorial of how I cooked the Green Noodles. The other night, we had friends for dinner and I wanted to make something with a bit of a “wow” factor. At the same time, I wanted to use what I had on hand as I didn’t much have time to shop. Khow suey ticked all the right boxes and so I would like to share with you, today, my interpretation of this famous Burmese dish. Khow suey is noodles served in a chicken/vegetable coconut based sauce and served with various garnishes. 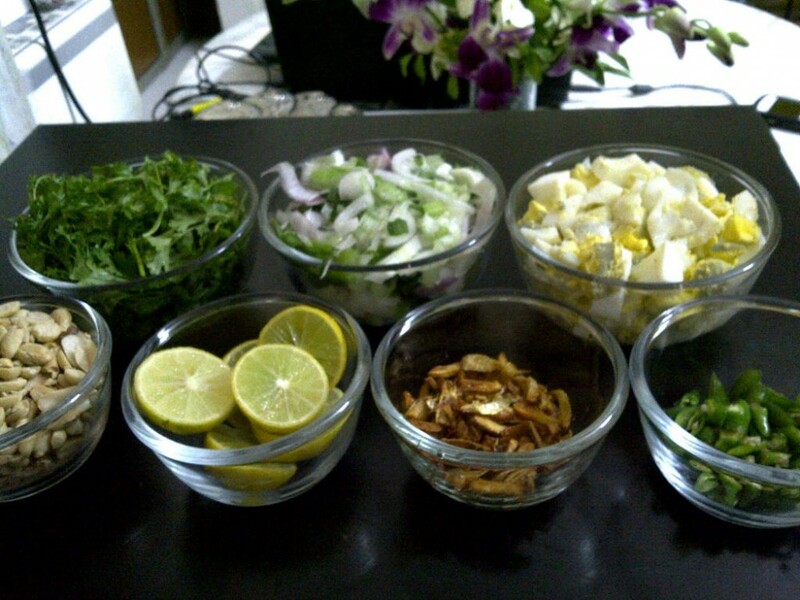 If you prepare the garnishes ahead of time, cooking the noodles and the sauce doesn’t take much time. Our friends loved it and we also loved it so much that we plan to make it again soon! Although I had made vegetarian khow suey, you can substitute chicken if you like. So, let’s get on with the recipe. This one serves 4 people. 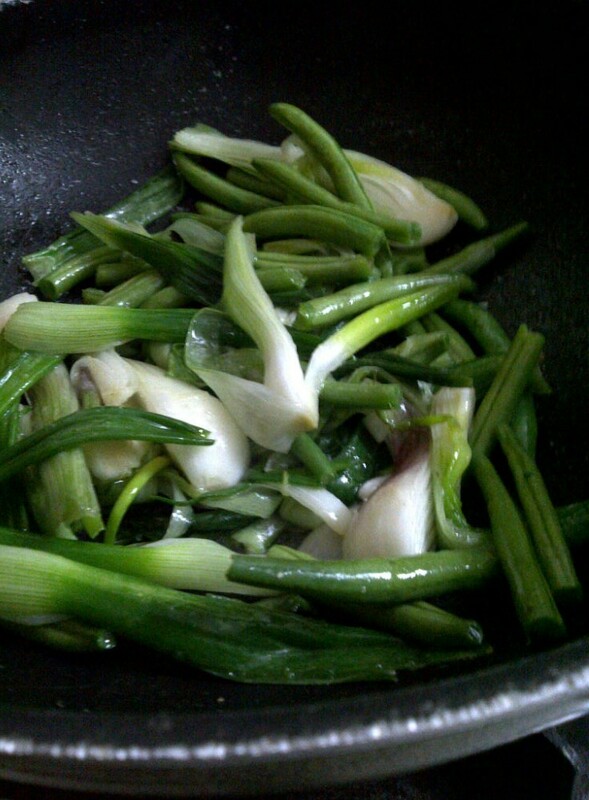 Make a paste of ginger, garlic and lemon grass. Heat the oil in a large saucepan. Once hot, add the chopped onions and salt. Once the onions are cooked (3-4 minutes), add the ginger-garlic-lemongrass paste. Add turmeric, chilli powder, cumin powder and coriander powder. Mix well and let this cook for about 5-7 minutes on low flame. Keep stirring regularly so that it doesn’t stick to the bottom of the pan. While the paste is cooking, mix the gram flour and stock cube in the coconut milk. I used chicken stock cube, you could use vegetable one instead or omit the stock cube altogether. Make sure there are no lumps in the coconut milk mixture. Now go back to the paste, add the vegetables (or chicken) and give it a good stir. Turn the flame high and add the coconut milk along with 2 cups of water. Stir, bring it to boil and once it starts bubbling, lower the flame, cover and let the sauce cook for about 10-15 minutes till the vegetables are cooked. While the sauce is cooking, boil water for the noodles and cook them according to instructions on the packet. Drain and divide them in dinner bowls (I used pasta bowls). Pour the sauce over the noodles and serve with the garnishes. Squeeze of lemon on top gives it a nice lift. If you would like to use chicken instead of vegetables, marinate cubes of boneless chicken in some salt and turmeric powder for 30 minutes. Cook for 30 minutes till chicken is done.